One of the great pleasures of Easter each spring is enjoying brunch with family and friends. 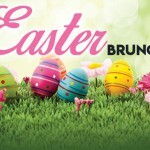 This Sunday, April 19, there are plenty of Easter brunch offerings around World Golf Village, Ponte Vedra Beach and historic St. Augustine. 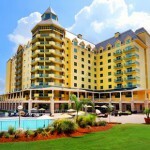 Villagio at the Renaissance World Golf Village Resort brunch is from 11 a.m. to 3 p.m. The cost is $48 for adults, $24 for kids and $38 for seniors. Reservations are required. To reserve, call (904) 940-8623. Villagio is located at 500 S Legacy Trail, St. Augustine. WGV’s Annual Red, White & Boom Event is Back on July 3rd! 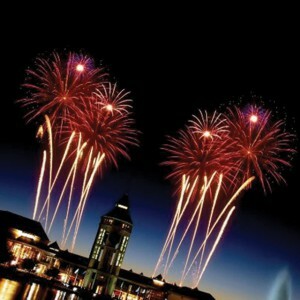 World Golf Village’s annual Independence Day celebration is right around the corner! 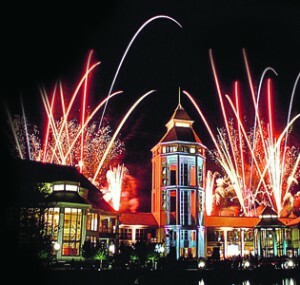 Make sure to mark your calendars for one of the largest fireworks displays in North Florida happening on July 3rd in The Village. Not only will there be amazing fireworks, but you can also take advantage of dinner and an IMAX movie! World Golf Hall of Fame and IMAX Theater’s Dinner and a Movie package is a great option for families. Have dinner at the Fairways Café before watching Terminator Genisys on the big screen! The All-American Buffet Dinner is from 5 to 6:30 pm before Terminator Genisys from 7 to 9 pm. You can also enjoy free putting on the 18-Hole natural putting course. Pricing for IMAX Annual Pass Members is $35 and General Public is $40 (parking included in price). Make sure to buy in advance. This package will likely sell out. 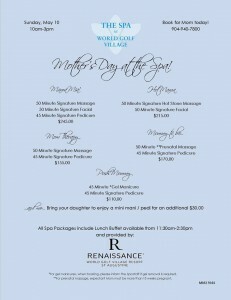 Spoil Mom with a World Golf Village Staycation this Mother’s Day! Mother’s Day can be hard to plan for…what to do? Where to go? What to buy her? Luckily, this year there is a LOT going on right in our own backyard for the whole family to enjoy. Make this Mother’s Day a “staycation”! 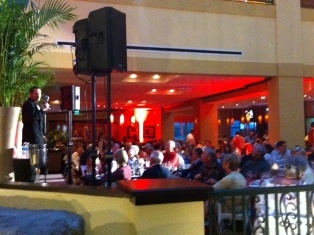 Black and Blue Grill: Did you know Black and Blue Grill just won Best Family Restaurant by the Taste of St. Augustine? They are offering a delicious Mother’s Day menu from noon to 9 pm on Sunday, May 10th. Reservations recommended! Find more information on their Facebook Page. The King & Bear Clubhouse: Enjoy a Mother’s Day brunch buffet at the King & Bear Clubhouse from 11 am to 3 pm. The buffet includes everything from an omelet station to raspberry glazed salmon and a prime rib carving station! Non-members welcome. Reservations required – (904) 940-6207. Get ready to tee up and fill up with us at this year’s Golf & Wine Fest beginning this Friday, May 17 with featured events through Sunday, May 19. 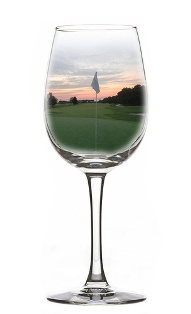 Whether you’re a golfer, wine enthusiast, or just enjoy the beauty of magnificent golf views, the 2013 World Golf Village Golf & Wine Fest will be a great chance to unwind and enjoy time with friends. Not only will guests enjoy wine, golf, and plenty of fun, a portion of all proceeds will benefit the American Cancer Society through its Annual Relay for Life event (World Golf Village Chapter). Contest draws 1,268 entries and plenty of water cooler chat! We knew we’d have some entries when we created the new Name It, Play It contest but when the entries climbed to over 1,000 we were pleasantly surprised. The contest also generated a lot of buzz. We heard neighbors talking about it in the fitness center, it was discussed on the golf course and we even heard chatter about it in Publix. And then there were the emails…let’s just say some people were passionate about their entries. In the end, the entry with the most votes (591 to be exact) was Kingpin which cleverly speaks to Arnold Palmer’s nickname as The King and, of course, the golf pin. Name It, Play It Contest Going on Now! Name Arnold Palmer’s Favorite King & Bear Golf Course Hole! The Neighborhoods of World Golf Village, Renaissance World Golf Village Resort and Beach Club and Honours Golf are teaming up for a once-in-a-lifetime shot for golf fans to leave their mark on the renowned King & Bear Golf Course by coming up with a creative name for Hole 15. The person with the best name will win a three-night stay for two at the Renaissance World Golf Village Resort and Beach Club, golf for two on both the King & Bear and Slammer & Squire golf courses, a $500 travel voucher courtesy of the Neighborhoods of World Golf Village, a VIP tour of the World Golf Hall of Fame, two tickets to the IMAX theater and a commemorative brick on the Walk of Champions! Click here to Name It, Play It. Invite your friends, family and golf buddies to Name It, Play It too.